Camille Paglia is not known for her subtle communication skills. In fact, some who have seen her presentations, as I did in 2007, have characterized her words as artillery attacks, a continual spray of opinions and directives whose power can devastate an entire house. When leaving the room, it is equal parts destruction and inspiration. And so the format and style of her last two books Break Blow Burn and the most recent Glittering Images is a surprise. 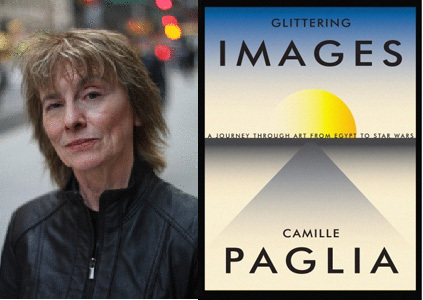 In these works, Camille Paglia offers a pause where there might have been an additional sentence (or paragraph). She has crafted a concise book whose focus is to bring the history of art to people who don’t really know anything about art. Paglia has chosen 29 works of art and provided a 5 – 6 page essay discussing the historical context and style of each work. No footnotes. No theoretical jargon. It’s as if you are spending an afternoon walking through a museum with Paglia after a nice lunch. With mimosas. Paglia’s reputation was made with the publication of Sexual Personae in 1991. It was her doctoral thesis from Yale University and it treaded, in detail, where many art historians did not dare. She looked at the sexuality of Emily Dickinson and the masochism of Emily Bronte. Its immensity (about 736 pages) and conceptual language is in sharp contrast to Glittering Images and its highly disciplined choice of topics and restrained use of language. With Sexual Personae and Glittering Images it’s as if Paglia has presented a two-pronged attack on the art elite: first to let the educated know that they are not quite as nuanced and sophisticated as they think they are and second, to let the educated know that the common reader can appreciate and understand their world of mystery and aestheticism just as well as they can. Paglia’s choices span art history – beginning with tomb paintings of Nefertiti to Revenge of the Sith , the last installment of George Lucas’ Star Wars Saga. An introduction to Vergil and the character Lacoon shows the reader to the interplay between text and Greek sculpture and a closer look at Anthony Van Dyck’s Lord John Stuart and his Brother, Lord Bernard Stuart provides an overview of 17th century costume. The Death of Marat by Jacques-Louis David, tells the tale of the 25-year old assassin Charlotte Corday and Life Makes You Happy by George Grosz demonstrates the subversive, protest beginnings of comic book art. Glittering Images is more than just an art history book. It presents a way of talking about art that has been overlooked by the art culture itself. Craft and context take precedence over theories and the interchange between the art itself and the viewer is more important than the age-old “what was the artist trying to say.” The survival of the art world depends on its accessibility. And though that accessibility is oftentimes at odds with the revenue goals of gallerists and auction houses, the inherent and long-standing power (and value) of a Picasso depends, in part, on a universal understanding of its meaning and importance. Without the type of reformation that Paglia speaks of, the art world (and industry) may continue to make the elite wealthy but only to find that its next generation of buyers and collectors has never seen the beauty of Picasso’s Les Demoiselles d’Avignon.